I wrote an earlier article showing the unbroken chain from the Exodus in Egypt (circa. 3300 years ago). The article takes us through the end of the biblical era (circa. 2500 years ago), over 1500 years in Babylon (aka. Iraq/Iran) (in this case, ending about 1000 years ago), Spain (ending about 600 years ago), and then through Eastern Europe (ending circa. 75 years ago) through today’s Jews in the United States and Israel. 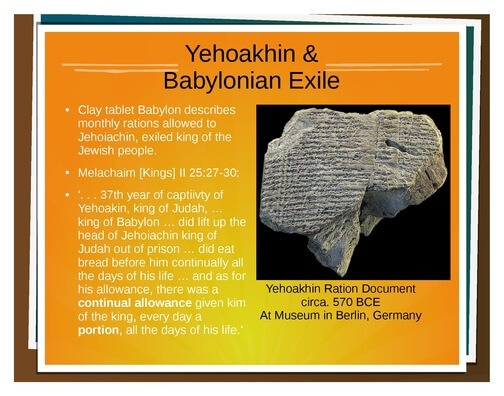 Further to the written article, slides are provided below with some more details such as the Yehoakhin Ration Document linking the written Bible to the chronology in Babylon, as reported by “independent third parties” (e.g. 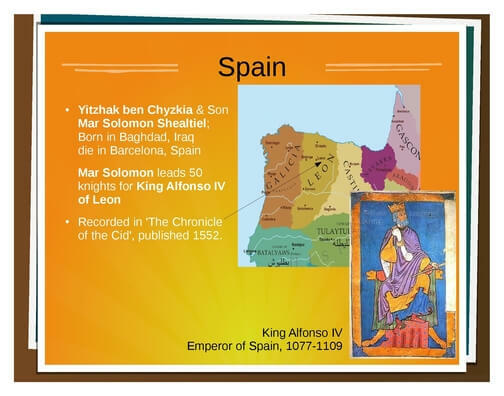 those of the Babylonian kingdom), and The Chronicle of the Cid from the Spanish in the 1500s. A higher quality version (easier to read) can be downloaded here in PDF format. The “private” version for my family’s seder actually continues to my youngest daughter. If you shoot off from this tree somewhere, I am also happy to provide an editable version that you can freely markup and continue to your own family. Just contact me and I’ll get back to you. We start with the Genealogy in Ruth – this takes us from Nachshon, brother-in-law to Aaron who was at the Exodus itself. Now we take it through the first temple. 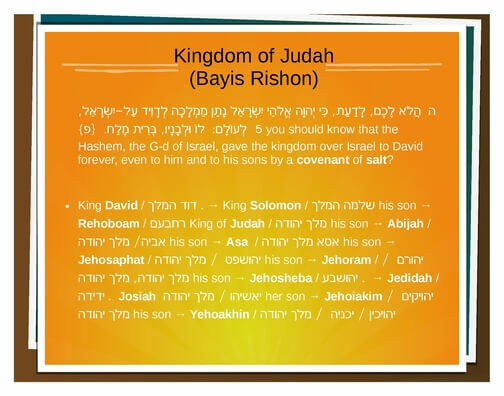 These are the Kings of Israel. This is lifted straight from the written Bible as well as Talmud where this is recorded. 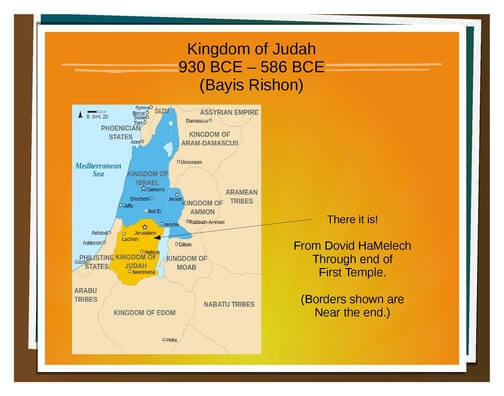 Here’s a depiction of the kingdom of Judea and Israel near the end of the First Temple Period. After this, the Jews become dispersed, mostly to Bablyonia and later to Italy. This tablet was found in Iraq corroborating the name and the description of what happened to one of the last kings of Israel, taken into exile. The descendants were then heads of the yeshivas, courts, and Jewish people in exile where we prospered under the Saasinid Empire. 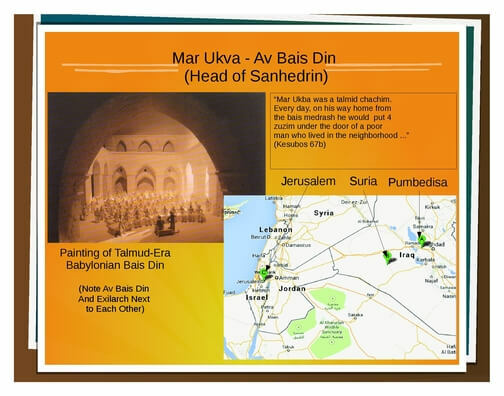 Here’s a picture of such a yeshiva with a map showing the location. Today, these locations are Falluja, Baghdad, and other places heard in the news. 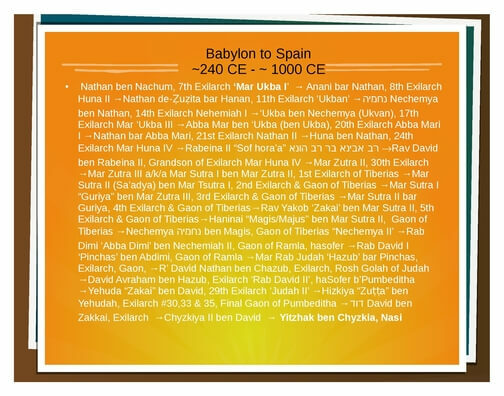 Here’s the rest of the Babylonian line … though there are other branches that can be used, this is the shortest and probably one of the best documented and many of these are great scholars known in the Torah. When Babylon became less friendly under Muslim rule (their friendliness fluctuated), Jews found refuge in Spain under Christian rule. This went very well, but didn’t take long until the Jews did better under the Muslims once again. Now the lineage starts to fan out into Eastern Europe, especially with the welcoming of Jews in Poland with laws more favorable towards Jews than non-Jews! In this family tree, the migrations became more common though still ‘only’ happening every few generations. … with no more than about 40 distinct seders to take us back to Nachson, the first in the water. 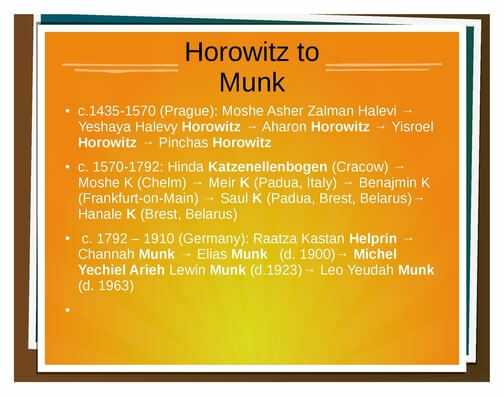 So let’s analyze Yetzias Mitzraim to Dovid. There are 5 or 6 generations, depending on whether Salman was alive at that point. In the Roman timeline there are ~300 years for those 5-6 generations. That’s an average of 50-60 years per generation, which is a stretch, but one that can be explained. In the Jewish timeline there are ~500 years for 5-6 generations which is 83-100 years. I don’t think that there’s a way to explain that logically. Interesting. I note that Pinchas isn’t even given a date on simpletoremember’s timeline. 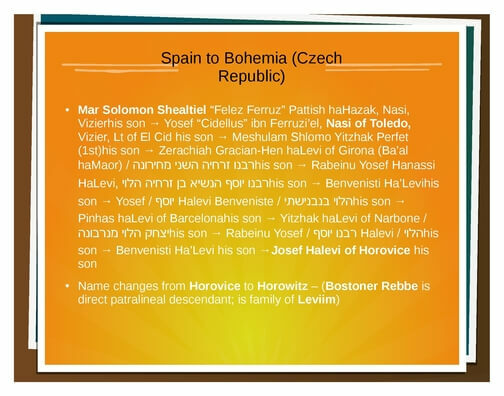 Dovid was 30 when he ruled placing his birth in 1054 in this timeline. That gives us 392 years between Yetzias Mitzrayim and Dovid’s birth. I don’t know how old Nachson was during yetzios mitzrayim, so I’m going to work with the age of 15. That would make him born in 1461. 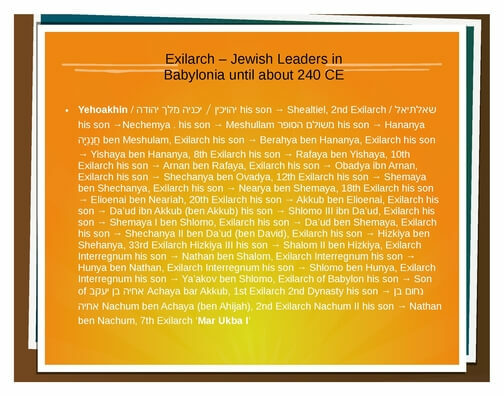 Now we have 407 years from Nachson’s births to Dovid’s. As President John Tyler (born 1790) still has living grandchildren over 200 years after his birth (see http://www.snopes.com/history/american/tylergrandsons.asp ) this is not a stretch. Up until the past 100 years, it was common for men marry again late in life to much, much younger wives (actually, I have an article about ‘trophy wives’ on this blog too 🙂 … it’s been going on since before Noach). John Tyler fathered children into his 70s as did some of his children. That’s two generations over 200 years, well here, we have five generations over 400 years. It’s plausible and I would say, even logical, though a stretch by today’s timelines but only if we make the assumption that age of child bearing and fertility was physiologically the same at that time, as it is now. I come up with a figure of fathering a child, on average, at 81 years old. 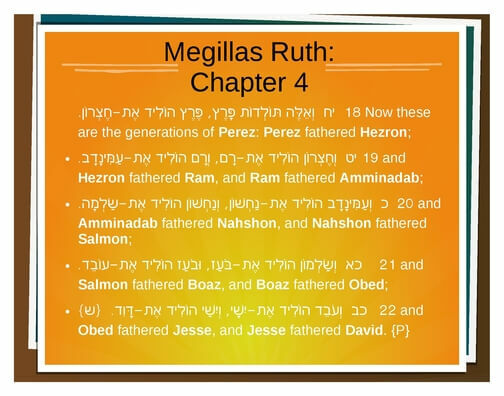 in fact, this fits quite well – the Midrash for Sefer Ruth says that Boaz was 80 years old when he married Ruth! That would make Obed born when Boaz was 81! If Boaz was 80 when he married Ruth, that makes his birth in about 1220 according to the biblehub timeline. So we have 241 years left between Nachson’s birth, Salmon, and Boaz’s birth. Okay, now I run into a problem. That’s not enough time unless Salmon and Boaz were born when their father’s were 120. Do we have biblical accounts after yetzias mitzrayim of child bearing that late? I know we do pre-Mitzrayim where the length of life was clearly very different. … I was doing so well up to here, too. Time to write some people who might be able to answer. Let’s define a generation as the time between the birth of the father and the birth of the son. In Tyler’s case there were 71 years until generation 1 and 75 years until generation 2. That’s 143 years for 2 generations, not 200 years. Taking that further, you’d have 545 years between the birth of Yaakov and the birth of Nachson (Yaakov @ 2006, Yehuda, Peretz, Chetzron, Ram, Aminadav, Nachshon) for an average of 91 years. On top of that, you have a problem of chronology with the second temple. In this chronology, the First Temple was 959-586 and the second was rebuilt in 444. That’s 140 years of galus instead of 70. We also hold that the Second Temple stood for 420 years, which would make it’s building in 350 BCE. It seems we are not the first people to deal with this issue. Do you know of sources which have resolved these issues so we need not reinvent the wheel? Suffice to say, I have not found good sources for same online which is what prompted me to blog about the family tree in the first place. I will try and look further into the writings of the Ibm Ezra. In terms of Pinchas, the chronology on simple to remember is definitely of interest. It does not discuss this problem, but does discuss the reconciling between the Jewish and Greek chronology and is interesting anyway. This is still bugging me. Okay, Nachshon had to be at least 20 years old during the yam suf because he is counted in the census / leader of the tribes. That cuts 5 more years out between Nachson and Dovid. Nachson’s Geni entry has him living 211 years. Salmon is listed as living for 136 years. In addition to the length of life problem, it also would mean Nachson entered Erertz Yisroel which seems to be a contradiction. I don’t see a source there, so time to write the curators of the biblical profiles on Geni. Here’s another interesting tidbit I found. Exodus 6:23 mentions that Nachshon was the brother of Aaron’s wife. Commentaries say that he was mentioned in that context to show that it’s a valuable thing to inquire about a potential brides brothers before marriage. That probably means that Nachshon was at least a teen during that time. Pinchas, Aaron’s grandson was at least a teen ager when he crossed yam suf. 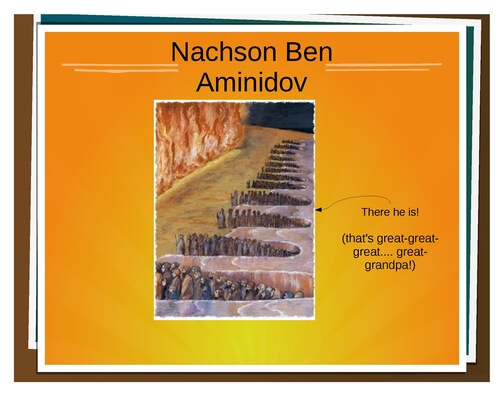 That implies that Nachshon was at least 40+ when he crossed the Yam suf. This Chabad article was the source of the information abut Nachshon’s relationship with Aaron. It mentions that he was one of the 70 Zekeinim, and therefore died a little bit after Matan Torah as a G-dly punishments for one of the national temper trantrums. That jives with Olam Rabbah (Igrot Kodesh, vol. 3, p. 225). See the article for more details. Geni says that Boaz lived for about 200 years. Doh. Yup… I wrote to Shmuel Kam (Geni curator of biblical profiles) to see what he says about it. A Rabbi from Lev L’Achim was here collecting. They do kiruv in Israel. I asked him the question. He didn’t sound like he remembered totally well, but he said that he thinks Yishai [Jesse] lived for a very long time. He is one of the four people mentioned in the Gemora who never sinned. Their assumptions is that the earlier ancestors, Nachshon and Salman, were the ones that had children in their 100s and that the later generations were in their 70s. The Jewish timelines would require another 20 years per person or so. I will review it further when I get a chance and may just have to buy this book. I went based on what’s the the profiles on Geni, though even there, there are some obvious errors (like a son born 5 years after his father). It might be interesting, now that people have crowd-sourced the entire tree, to figure out based on ages and what not what an accurate number is likely to be, though even there, there are questions as to whether certain individuals are one person or two due to copyist errors and that sort of thing. As I imagine you’re aware, there is a difference between the Jewish timeline and the Greek timeline, I think, by about 200 years. The secular world today, and probably Wikipedia, uses the Greek’s timeline of ancient history. Jewish sources say they’re mistaken with things like the aforementioned errors, and I’m not sure Greeks have a full timeline. On somewhat related tangential note which is fascinating to me, in their past, they were busy doing things like burning libraries in Alexandria and trying to make things fit into two very different, contradictory, and written after the fact genealogies in the New Testament. Hence, with the exception of R’Shimon Schwab, we tend to trust our limeline over theirs. I heard, but haven’t seen, that R’Shcwab changed his mind about his theories later and held by the Jewish view, as well. I asked R’Dovid Cohen the question about Dovid HaMelech’s lineage. His initial response was that there are also other places in Tanach where only important people are mentioned and it skips the listing of other generations. He asked me if I looked in Divrei HaYomim [Chronicles] and said this would be the place to look. I will look further there, but I doubt it’s in there or the Ibn Ezra would have said that. He concluded that it was a good question and that I should I contact him if I find an answer. Interestingly, tonight he also spoke about certain errors that have been passed down and, if I understood correctly, he considers the pronunciation difference of ‘migdal’ vs. ‘magdil’ in benching to be one of those. I don’t think he’d say this was a mistake. Another answer that someone else pointed me to today (I suppose I’m a bit obsessed with this question) is that at the end of Ruth, it says “Salman” and then the next generation, it says “Salmah.” Perhaps they are not the same person, but had a similar name, e.g. like a grandson being named after a grandfather. The one commentary I saw on this so far indicated that, no, they are the same person.